Being a big Hot Toys fan, I'm super impressed with the company's line of recent Batman figures. Yet realistic isn't the only way to go about making incredible Batman toys. You can also take the stylish route. 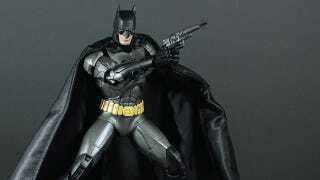 Based on comic artist Jim Lee's recent interpretation of the Dark Knight, this figure's torso, arms and legs are made out of "die cast metal alloy". It has 50 points of articulation. And at 1/6 scale stands 12 inches tall. It's even magnetic, so it just "sticks" to that badass gargoyle base.